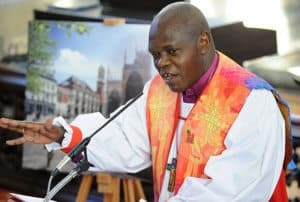 Bluecoat Academy Primary, Nottingham was officially opened and blessed by the Archbishop of York today. Our design for the 420-place school situated in Harvey Road, Bilborough is the first Church of England Primary school to be opened in Nottingham for more than 10 years. The school has 15 classrooms, a larger than usual hall (part funded by the diocese), spacious learning streets on both floors that provide break-out areas for smaller group or individual learning, a specialist unit for children with autism and a 26-place nursery. “Parish churches will do weddings, funerals, etc. for anyone of any faith, and that’s what schools are doing. The fact there is a new school opening shows that parents are demanding it. The Archbishop of York is the most senior person of the church in the north of England, so was invited along to bless the school. He previously opened the Trust’s secondary school – Bluecoat Academy – in 2008. “The school encourages all children to ‘strive for life in all its fullness’ (John 10:10).